The church is over 900 years old and for many years was the only church in Cuckfield. It is situated on the south side of Cuckfield with views from the churchyard to the South Downs. The first Baptists met in a local house until the church was built in 1772. After a chequerued history of closures it was re-established in 1957. 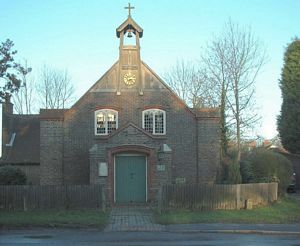 The chapel is situated at Polestub Lane. The chapel in Broad Street was established 1821 but closed during the 1900s. The chapel is now used as offices. William Payne was a very active member and generous benefactor of the Chapel. The chapel was originally in London Road but has now closed. The Mission Room in Brook Street was well used by the small community. It was originally called the Iron School Church. It was opened on Advent Sunday in 1879 and closed in the 1960s. St John’s, Ansty was opened in 1883 and rebuilt and dedicated in 1909 by the Bishop of Lewes as a memorial to T W Best, father of Miss Louisa Best, who had it erected at her expense . It was ministered by the clergy of Holy Trinity Church, until its closure on 25th December 2000. Popular concerts regularly took place in the Mission Rooms, with people walking from Cuckfield to enjoy them. On the 15th January 2001 the Bellringers at Holy Trinity, Cuckfield rang a Quarter Peel to commemmorate the closure of St John’s Church.